Nothing scheduled at this time! These designs are available as class workshops with Linda Lachance. They are each two-day classes. Please directly for teaching schedule and fees. Any of her other designs are also available as workshops. She'd love to visit your Chapter, Guild or your shop to teach a class! Come and explore the use of an abalone shell as the centerpiece for a unique design which uses the shell for colour and design inspiration. Three different colour schemes are linked together, working from light to dark throughout the design. Learn how to attach the shell with a peyote beaded bezel technique. Stitches in the design include a variety of Fleur de Lis, 4-way bargello, Rhodes, Jessicas, crescents and eyelets. The class will include a section on designing with the Fleur de Lis stitch, and how to create your own combinations with them. Stitched on 18 count canvas, this is a design which is easy to see while working. “Stitcher’s Candy” is the theme for this project. 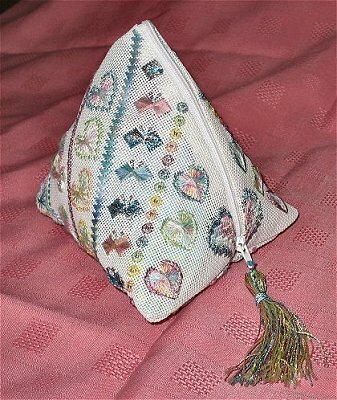 Students will learn a variety of canvaswork stitches including Fleur de Lis, Jessica, many variations of Rhodes stitch hearts, Dropped Rhodes, Milanese and Bargello while stitching with luscious candy colours. Then you will assemble the stitching into the neat humbug bag shape, lining it with co-ordinating fabric. 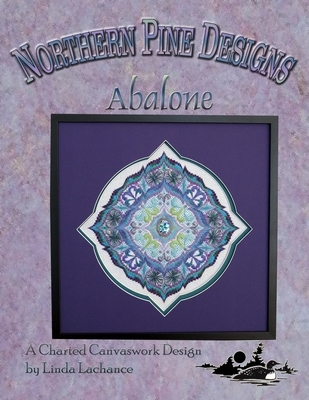 © Northern Pine Designs 1999 - 2015 - All rights reserved.